I applied for a Schengen Visa for Slovenia on the 23rd of April. After a few days, my visa got refused stating, "you have not provided proof of sufficient means of subsistence..". This was despite having sufficient proof of funds in my sponsor's bank account. I have submitted all documents accordingly but they still refused my visa for the above reason which I think is totally false. My trip is being sponsored by my dad and his funds are enough to support the travel. I found through various sources that this might have been due to the fact that I'm unemployed, and that they are suspicious that I will overstay my visa and become a potential illegal immigrant. Whereas I've no plans on doing so nor any interest. I am planning to ask for a review of my application, but I am confused what should I do so that they take up my case for review again and approve the visa this time. Is there any chance my visa will be approved? 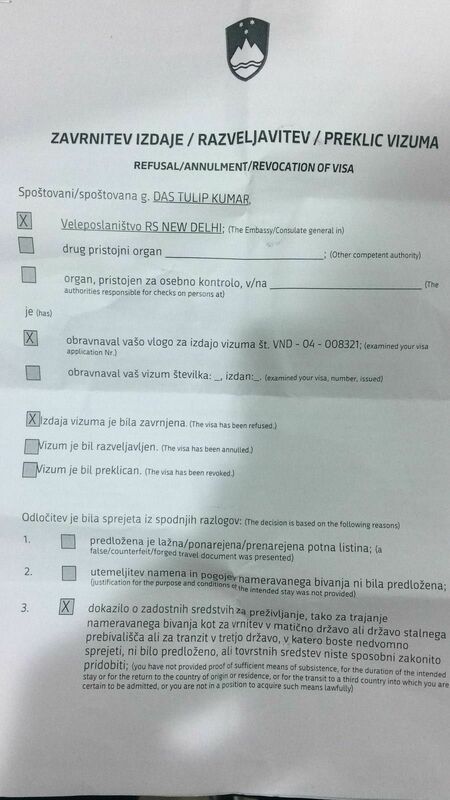 Please help me regarding what I should do so that my visa gets approved. I am planning to visit Slovenia this July 16th, for a music festival where I'll be meeting my girlfriend for the first time ever. I am 25 and have enough funds in my sponsor's account to support this trip. I am extremely sad and anxious. Please, please help! Edit 2: Since my visa was denied due to lack of funds("insufficient means of subsistence") will the embassy re-consider it's decision if my sponsor puts in more or adequate amount of money before I make an appeal or re-apply? Or would that make me look suspicious. How do I fix this issue of less funds if I have to appeal or re-apply without making them think I have malicious intents. The Schengen countries try to welcome genuine tourists and refuse entry to illegal immigrants. They cannot know what a person will do in the future, so they must go by the documents. You will need both money for the trip and for your stay in the Schengen area. I think Slovenia wants to see €70/day, which adds up to quite a sum over a few days. Do you have that money, in addition to your ticket? If your girlfriend plans to give you housing and food then you'll need less money, but explaining this would make it even harder for you to convince the visa authorities that you will leave again. Even if your father pays for your trip, you will have to document your financial circumstances as well as his. Did you? Being unemployed does not lead to an automatic refusal. But it means that the rest of your application has to look good. My guess is that the initial decision is correct according to the documents, and that an appeal will not help. In the EU it is entirely normal that official forms contain information how to appeal them, that does not mean an appeal is likely to work. Follow-Up: When someone else pays for your trip, your account still has to show a stable lifestyle with regular income exceeding regular expenses. Even if that income is money from your parents (which is not uncommon for young people). If the money for the trip is a gift to you, you should be able to use it as you please, so it helps if you have it. I'm from India as well (got several schengen visas over the years). You haven't mentioned your age. If for e.g. you're 25 and unemployed, the Embassy might feel there is a chance of you staying back in the Schengen area, since you have no job to come back to. Does a second Schengen visa refusal through appeal hamper my future travels? How to appeal a refused Schengen visa?